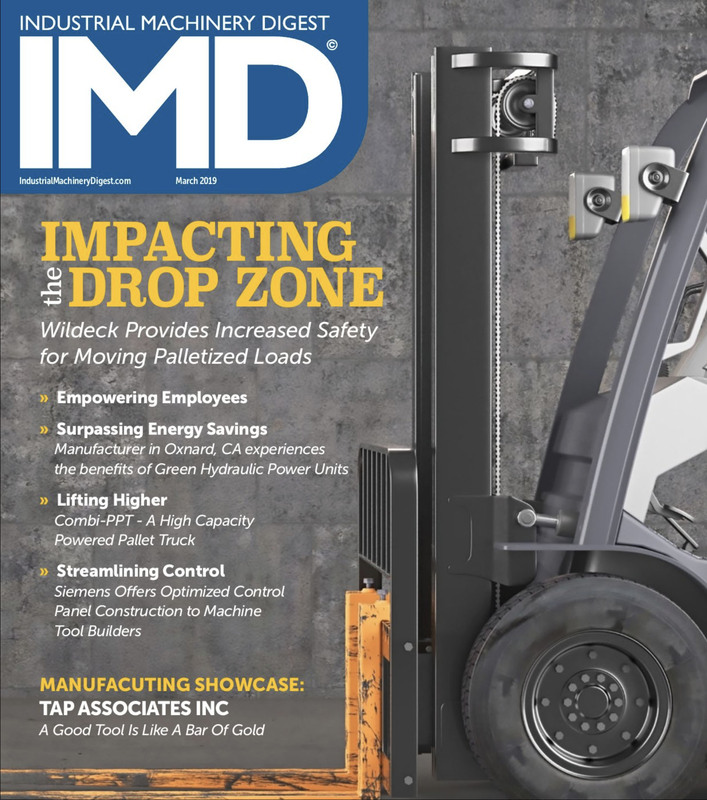 Wildeck, Inc. would like to take the opportunity to share with you the most recent edition of Industrial Machinery Digest (March 2019) which features Wildeck’s Pallet Drop Zone Safety Gate™ on the cover of the publication. The DZ Gate and its many safety features are more extensively explored on the two-page spread inside the magazine. A link to the digital edition of the publication can be found here. As the newest member to Wildeck’s family of material handling products, the DZ Gate offers an unparalleled amount of protection to workers accessing large pallet loads at elevated levels. Unlike many of the other safety gates on the market, the DZ Gate is specifically designed to create a tighter pallet transfer zone that benefits a facility’s overall floorplan. The DZ gate effortlessly integrates with pick module systems, creating a safer, more efficient material flow. At Wildeck, we believe that material handling solutions should seamlessly integrate into a facility’s operations. That is why all our products are designed with the end-user in mind. Our continual evaluation, modification and improvement process ensures that our portfolio of solutions provides the maximum level of protection without sacrificing operational efficiency. The DZ Gate is just one instance that illustrates Wildeck’s abiding commitment to end-user satisfaction. It is this commitment that has made Wildeck a trusted industry provider since 1983. If you are interested in learning more about the Pallet Drop Zone Safety Gate™ or any of Wildeck’s other customizable material handling solutions, feel free to contact us at info@wildeck.com or (800) 325-6939. Our team of solution experts is excited to help you maximize your facility’s potential.